Bob Paladino & Associates, LLC is a professional service firm dedicated to helping you put positive Corporate Performance Management practices into place to improve your business. 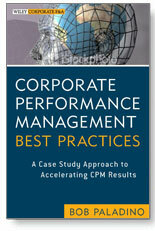 Our firm was founded by Bob E. Paladino, a long-time thought leader and "implementation" practitioner in the CPM field. We provide CPM services to help implement and integrate the Balanced Scorecard, Six Sigma, knowledge management, and customer survey programs that drive breakthrough results. We also book corporate speaker events, perform case studies, and write articles for companies. Make profitable changes in your business with support from Bob Paladino & Associates. Since 2002 Bob Paladino & Associates have provided CPM services to help companies implement and integrate Balanced Scorecard, Six Sigma, Knowledge Management, and Customer Survey programs to help drive breakthrough results. Many firms offer methodologies, but we focus on implementing for results. Our clients have won the coveted Balanced Scorecard Hall of Fame Award from Drs. Kaplan and Norton, founders of the Balanced Scorecard, based on business results. Hall of Fame winners have been profiled in their recent best-selling books, as well as in Harvard Business Review, Forbes, and Fortune magazines. If you're looking to make the most of Corporate Performance Management or to inspire your team with a corporate speaker, turn to Bob Paladino & Associates.